At night, I lie beneath the stars, year round. I smell like open sky, snow, and lake water. Nobody has to tell me my face is holy and beautiful. I dream in a language your people used to know. through car windows and house windows. I smell your children’s breath when they step outside. as you listen to your offspring breathing. We are not so different. We both gave birth. We both smelled danger in a man’s angry voice. We both know when to run and when to hide. We both know how to kick with our strong legs. We both know we are the ones on which someone else depends. We are the ones with the power of moonlight in our hair. We are the ones with the beauty of this land imbedded in us. My dad used to say magpies were a nuisance bird. I seem to see them everywhere I go. Magpie flocks flutter in the pine trees in my yard. They eat dog food from my dog’s dented metal dish. my words are a nuisance and are not welcomed. I will never kill a magpie. who must feed their young no matter what. that know these trees and lakes and deer from the sky. I will remember that nobody can be wanted all the time. One time or another, we have all been magpies. Sometimes I like to stretch out belly to dirt my face close to the earth. how much I love your hands on my head, my back, my ribs. and how all living creatures have wise things to say. when you weep silently in the wee hours of the night. how much the moon loves you, and how there is good magic in your dreams. Tonight, when you sleep, I will look at your closed eyes in the moonlight. I will listen to you breathing, and I will purr a thousand lullabies just for you. I wrote these poems shortly after my divorce. At that time, I was feeling particularly unloved by people. I had a few friends and was alone on many levels. Being in that position reminded me to reach for and acknowledge other connections and non-human beings that loved me. Jennifer Finley lives in Ronan, Montana. She’s the author of two books of poetry and a children’s book. Her forthcoming book of poetry is entitled My Hands Have Vertigo. Jennifer’s first love and soulmate is poetry. However, she’s also an award-winning journalist, and she’s a playwright. 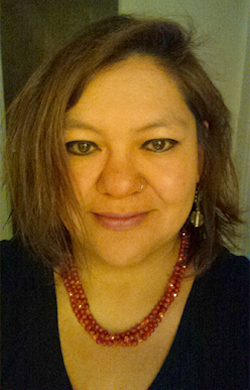 Jennifer is a member of the Confederated Salish and Kootenai Tribes, and she’s Chippewa-Cree. Jennifer is a mother, cat lover and a runner.